Our first stop was at Lake Crescent, a glacial lake that was carved out by the Juan de Fuca lobe of the Vashon Ice Sheet. 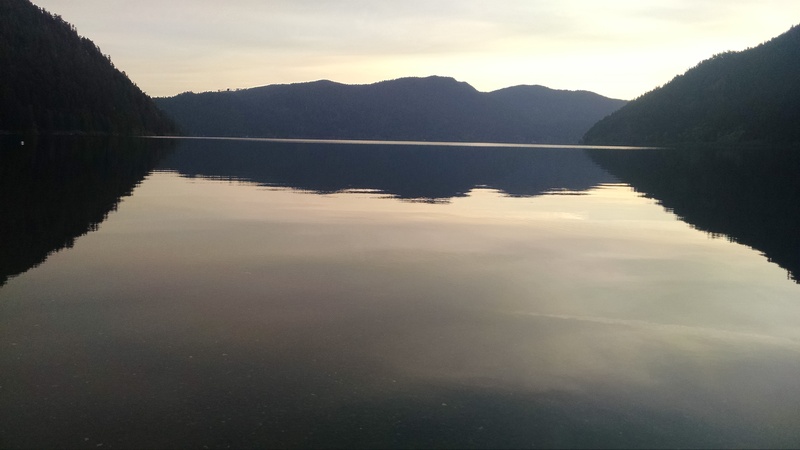 Lake Crescent is the second-deepest lake in Washington State—its bottom is well out of range of the depth sounder used to measure it. 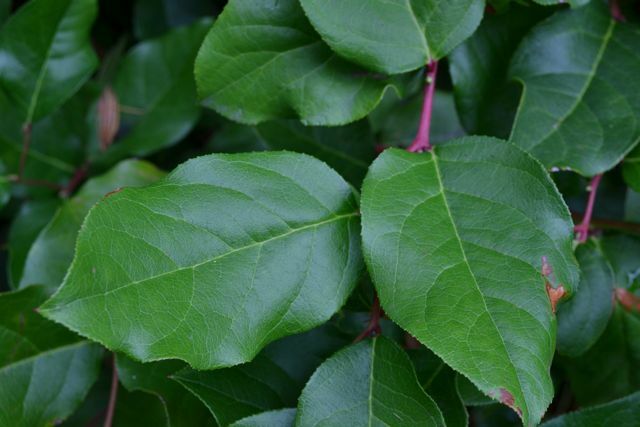 The surrounding forest is mostly old growth, though there were some areas that had been recently disturbed.These sections were identifiable by their copious amounts of RED ALDER trees, and there was even a portion that had little tree growth at all–it was all meadow. The old growth forest had a significant number of rather large trees (mainly conifers), lots of snags (trunks still standing with the tops broken off), and even some nurse logs, which are fallen-over trunks that are beginning to decompose, with other species growing in or on them. For the latter part of the afternoon, my friend (and co-intern) Alicia and I elected to hike up Mount Storm King, which would afford us a look at a slightly different type of landscape, a drier xeric zone on the north-facing side of the mountain, sheltered from the SW-NE weather pattern typical of this region. 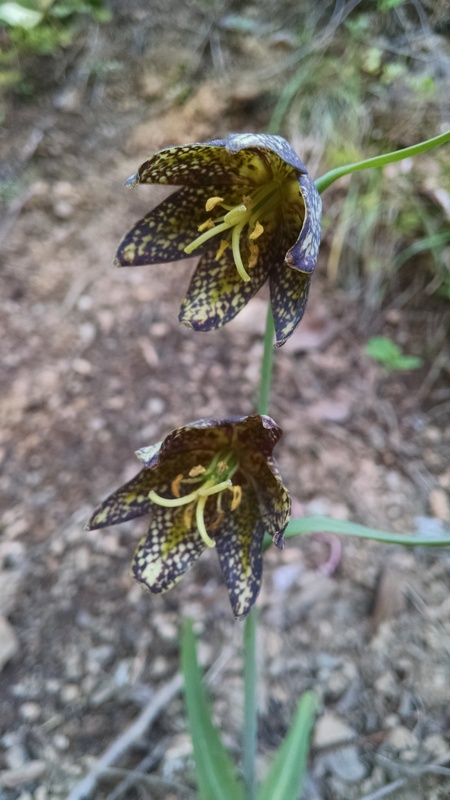 The trail up the side of the mountain provided a wide variety of plants we had hadn’t seen in the lowland old growth forest. 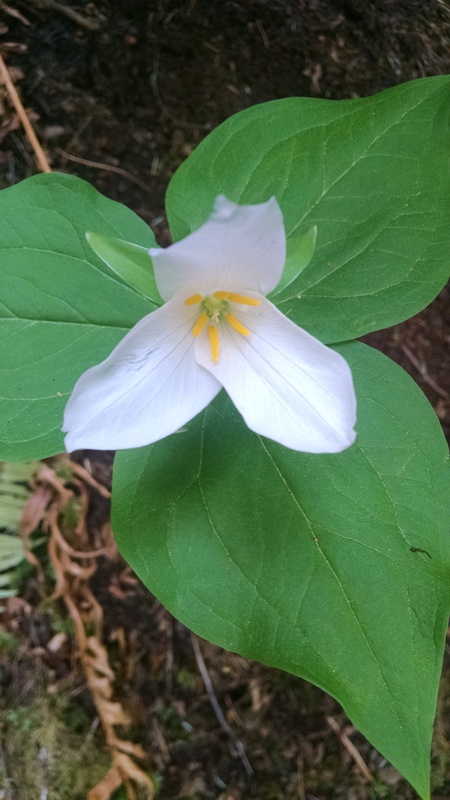 Among the myriad of plants we saw on the way up was the SALAL shrub, and CHOCOLATE LILY and WESTERN TRILLIUM flowers. Though the trail was long and steep, we eventually made it to the top. One glance out at the lake and surrounding mountains, however, was enough to convince us that the strenuous trek was worth it. The view from the top of the ridge was simply spectacular. I made an attempt to sketch it, but I fear my feeble drawing skills fail to do it justice. 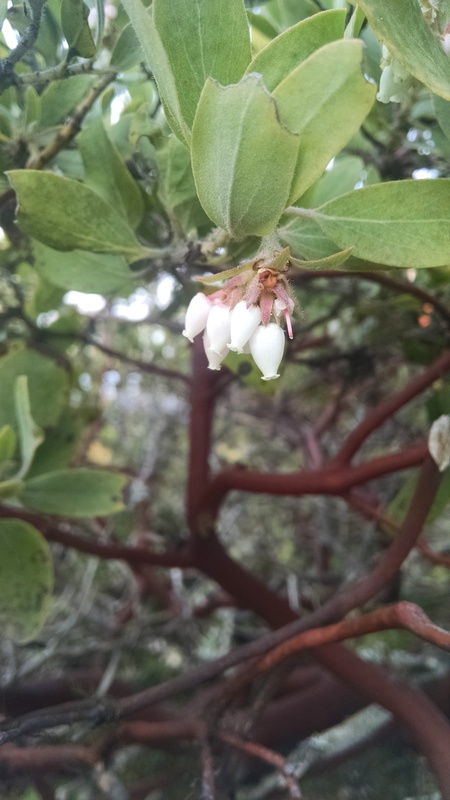 In addition to the larger-scale landscape view that was just gorgeous, there were also ample plant species in the area with which I could attempt a close-up sketch. 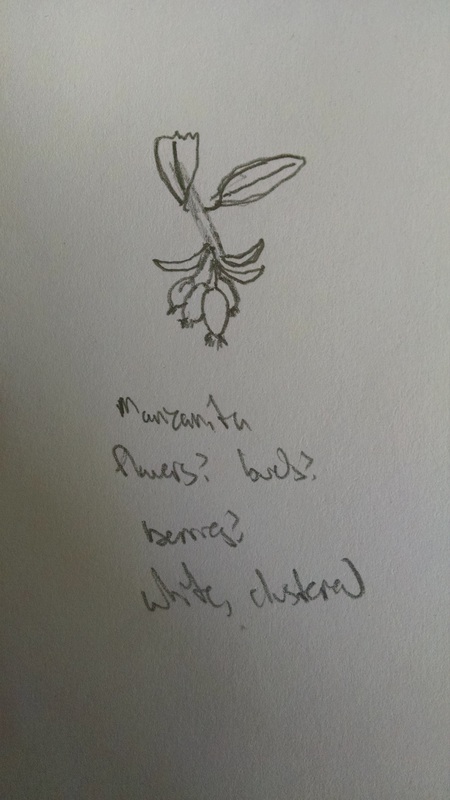 I chose a flower cluster of a MANZANITA shrub, and did my best to faithfully recreate it with pencil. The trip back down the mountain was no easy feat, but an off-key rendition of ‘Under the Sea’ helped keep both my mind and Alicia’s off the steepness of the slope. After making a wrong turn and briefly getting lost, we were able to trudge our way through the forest undergrowth and back to dinner with the rest of the class. That night, after a good meal we tried to identify maybe five or six species of owl calls, from NORTHERN PYGMY-OWL all the way up to GREAT HORNED OWL by playing pre-recorded owl calls. We were only successful in getting a response from the BARRED OWL–this was not surprising, as we had learned that this rather aggressive species had been pushing out the other native owl species form this region. The next morning we made our way to the northern coast of the Olympic Peninsula to visit the tide pools of Salt Creek. Salt Creek was probably my favorite part of the whole trip; I have always loved exploring tide pools, and this was the first real opportunity I’d had to do so in the Pacific Northwest. I was far from disappointed by the diversity of plant and animal life I saw. 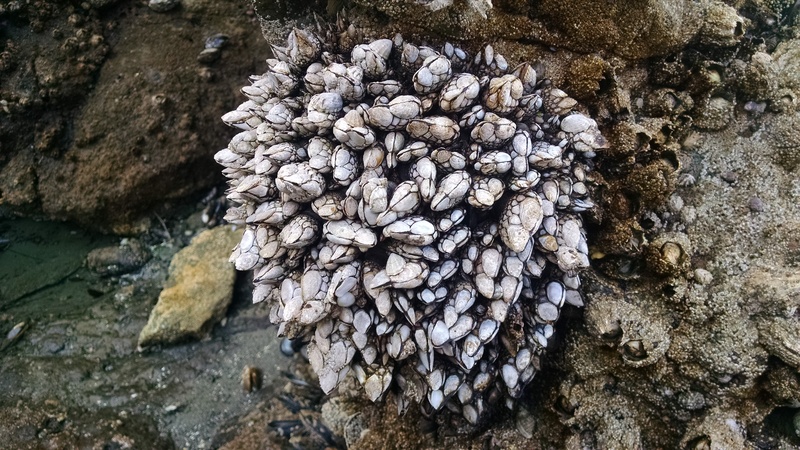 There were plenty of CALIFORNIA MUSSELS and PACIFIC GOOSE BARNACLES, but the rarer organisms were more interesting. There were a number of GIANT GREEN ANEMONES, but I found another species of anemone under some grasses in a pool. 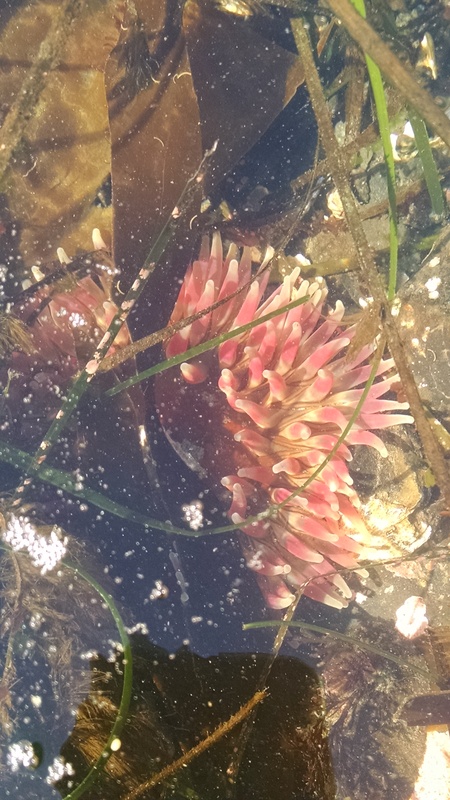 I took a photograph of it to identify later, but was unsuccessful in coming up with a bona fide ID for it: it is either a single AGGREGATING ANEMONE or a rather small ROSE ANEMONE. 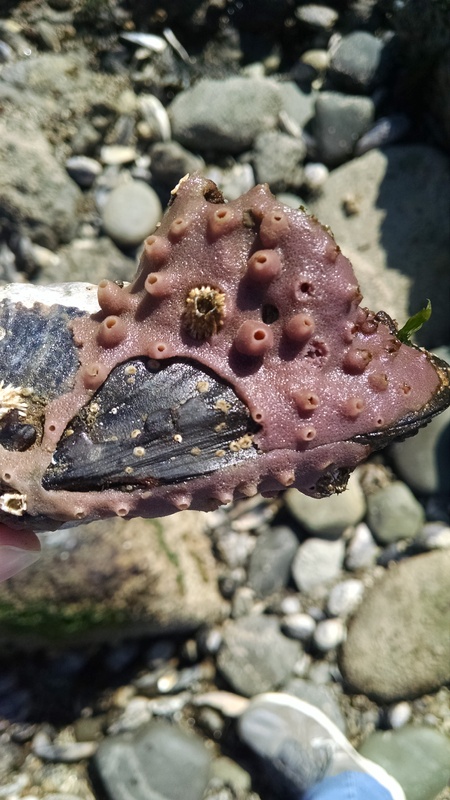 I also found a CALIFORNIA MUSSEL that had what I thought was VELVETY RED SPONGE growing on it. I sketched what I saw, and took a photograph, as my drawing skills are not the greatest. The Thursday before we left, as our professor was describing what we would be doing on the trip, he mentioned that the “holy grail” of the tide pools would be if we were to see an octopus. 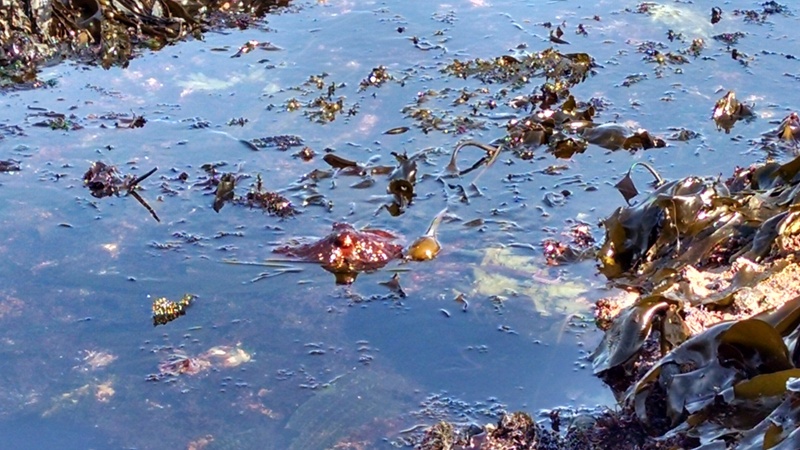 As luck would have it, I was standing near him and a small group of students when a girl shouted out that she saw an octopus. She was right, and everyone around was impressed. Others were scrambling to catch a glimpse of it, but I was lucky enough to be right nearby, and even snapped a couple pictures. 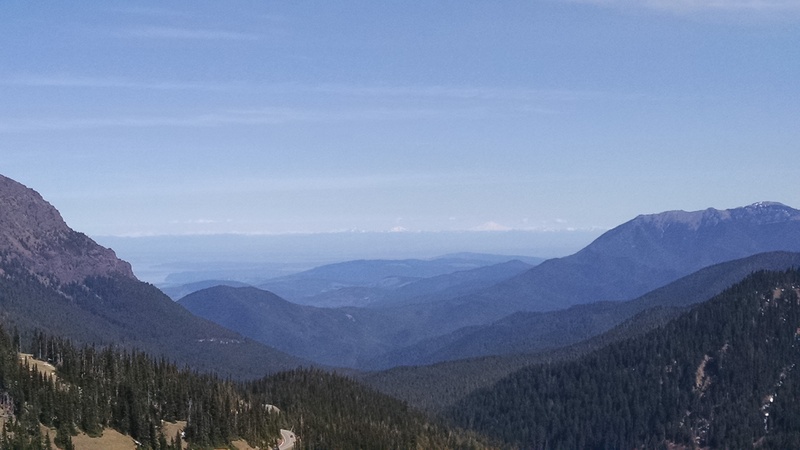 That afternoon we drove back inland into Olympic National Park to visit Hurricane Ridge. We didn’t spend a whole lot of time there, but it was enough to see the sights and make a quick sketch; mine was of the river valleys from 4000 or 5000 feet. The trees on the hillsides didn’t seem to be uniform, and there appeared to be sections that were shorter than the surrounding forest. After a brief discussion, the explanation we settled on was that there had been some sort of disturbance down there in the past (most probably a fire), and that the shorter trees were the younger ones that were re-growing after whatever the disturbance was. Once we departed Hurricane Ridge for Bainbridge and the ferry home, the bulk of our trip had come to an end. Our time out in nature was over, and I had put together a significant collection of sketches and photographs of different species. Though my collection by no means included every plant and/or animal species we came across, I felt completely satisfied. In fact, I knew that it was unrealistic to sketch or photograph every single species I encountered, and never expected to do so. It is important to keep that fact in mind when out on a trek of your own. Quantity is not what’s important in an endeavor such as this, but quality. Instead of setting out to get as many species recorded as quickly as possible, take your time, enjoy yourself, and sketch or photograph the most meaningful or important species or landscapes. Ultimately, that is what will be the most rewarding. This trip was exactly what I needed to get away and clear my mind after a stressful week. I loved every minute of the time that I spent out in the natural world, observing everything that I could and spending time with some great people. We hit a small snag on the return journey–we arrived just barely too late to catch the ferry we had wanted to catch. Even that, though, was a blessing in disguise, because our trip on the later boat also came with a breathtaking sunset view off the stern. 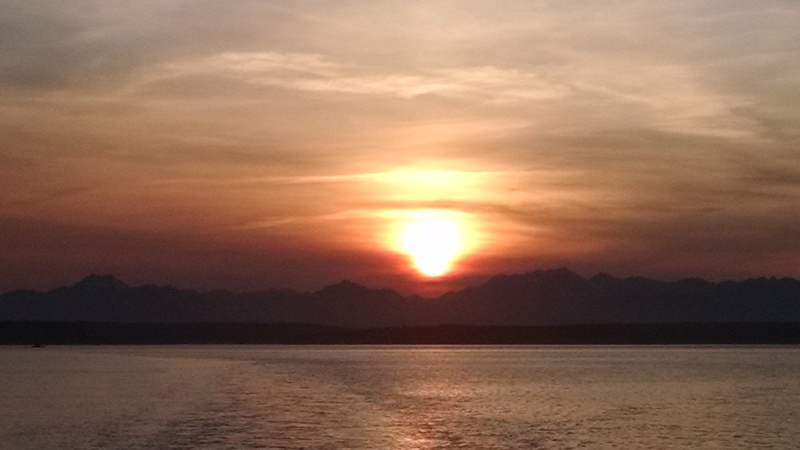 As we sailed back into Seattle, I stood at the rear of the boat and watched the sun sink below the Olympic Mountains, the place I had just spent two glorious days. That view provided a real sense of closure to what was the best weekend I’d had in quite a long time. As the day drew to a close and night began, my mind was not anywhere but in that moment. Not on the school week that lay just twelve hours ahead, nor the problems of the past. I existed solely on a boat in Puget Sound, slowly making my way back from a fabulous weekend getaway, doing nothing but watching, grateful to have had the opportunity to experience what I just had, a respite from the constant push and pull of society, and a chance to relax and reset.